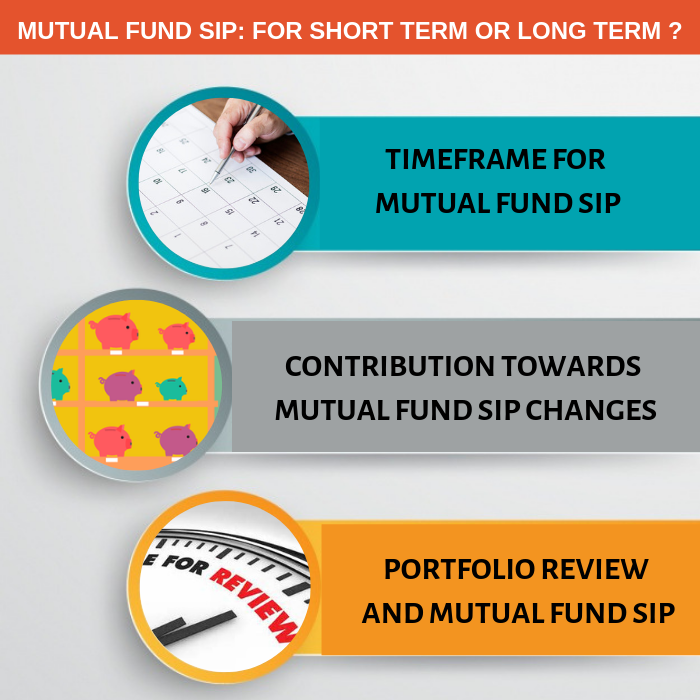 It may look very strange when everyone is advocating Mutual Fund Sip for long term, what is the necessity for this debate on ‘Is Mutual Fund SIP for Short term or long term?’. Before going into this, we will see what SIP & Mutual Fund is? SIP is a method of investing in mutual fund. When you invest in mutual fund, you can invest in two ways. One is Lump sum Mutual fund investment. where you invest your money at once. Another method is SIP i.e., Systematic Investment Plan where you invest same proportion of money at regular intervals. Theoretically doing a Mutual fund SIP for long term will work for investors. But for practical reasons we need to commit a Mutual Fund SIP for short term. That is we need to break that long term into many 6 months or 1 year periods and commit your Mutual Fund SIP for first 6 month or 1 year. Then at the end of 6 month or 1 year renew your Mutual Fund SIP for another 6 month or 1 year if it is still a good mutual fund for long term investment. You need to renew like this till you complete your predetermined long term period. You may think it is an unnecessary paperwork and waste of time. But you will be completely convinced when you have finished reading this article. How much you are contributing towards Mutual Fund SIP changes over a period of time. At the beginning of a career a person will be able to commit Mutual Fund SIP for small sum of amount. As he progresses in his career, he or she will be able to increase his contribution towards Mutual Fund SIP. Similarly, when someone reaches a stage where he need to spend more on kid’s higher education , daughter’s wedding, buying a house or meeting a major financial commitment, it is difficult for him to continue the same amount of Mutual Fund SIP contribution. So whenever you renew your Mutual Fund SIP at the end of 6 month or 1 year, you can look at your cash flow position and based on that you can renew the Mutual Fund SIP for the increased amount or the same amount or the reduced amount. Also it gives you a chance to review your portfolios with your financial advisor / investment planner once in 6 months or 1 year. The scheme which you have chosen for Mutual Fund SIP is performing well when compared to its peers or not? Is that still a good mutual fund for long term investment? You need to review this periodically. The scheme may turn out to be a laggard. The scheme may be performing well when you have chosen for doing mutual fund SIP. But over a period of time, it could have derailed from its performance. This is something like our cricket players. They will be in a good form in the game for some period of time. Then they will lose their form after sometime. So you need to periodically check up whether the fund is performing NOW or not. or you need to roam around to find how to close sip mutual fund, as you are not in touch with your advisor for a long time. If you commit for 6 months or 1 year he or she will be definitely coming to you for renewing the Mutual Fund SIP. You can have a review with him or her at that time. When you commit Mutual fund SIP for long term, generally we ignore to review it. It may generate poor returns. You can avoid this by periodic review. How much equity exposure you can give to your overall portfolio can change the amount of Mutual Fund SIP in equity and debt. As the age goes up, your ability to take risk comes down. So you need to change your equity mutual fund SIP contribution periodically. How close or distant you are to achieve your financial goals will also decide your equity exposure. If you have got long period to achieve your financial goal then you can have more equity exposure. When you have short period to achieve your financial goal, then you need to reduce your equity exposure. Rebalancing your portfolio based on your predetermined asset allocation will also decide your equity exposure. All this can change your Mutual Fund SIP amount in equity funds. So committing a Mutual Fund SIP for long term looks good on paper. For practical reasons we need to commit for short term and renew it at the end of every short term till achieving our financial goals. In this regard, instead of committing a Mutual Fund SIP just like that, having a long term financial plan and committing Mutual Fund SIP based on that plan will be really fruitful. This will make a solid difference in achieving your financial goals. This is my first time visit here and i am actually pleasant to read everthing at single place.